E-mail written 2000 (GEDCOM) to Lew Griffin from James Jeffrey Culpepper, Morgantown, WV. W. F. Culpepper and Julia Reed, 27 May 1894, Jackson Parish, LA. William F. Culpepper, 1902 Jackson Parish, 162.8500 acres/15301052. E-mail written 2005-2010 to Warren Culpepper from Jack Haywood Culpepper Jr., e-mail address (Mar 2010). Jack H. Culpepper, Son, M, 5, LA/LA/LA. E-mail written 1999 to Lew Griffin from D. Herring. Iris Estelle Culpepper and Robert Ewell Wright are the parents of Robert Ewell Wright Jr., Male, born __ 1939, and James David Wright, Male, born __ 1944, both in Upshur Co., Texas. Gerald A. Culpepper, Son, M, 10, LA/LA/LA. Benjamin Culpepper and Clara Walker, 6 May 1910, Jackson Parish, LA, Book H, p. 360. J. A. Culpepper and Winnie Robinson, 3 Jul 1898, Jackson Parish, LA, Book F, p. 165. Bulah Culpepper, Dau, F, 13, S, LA/LA/LA, Not employed. Lesie Culpepper, Wife, F, 17, M, md@14, LA/LA/LA, Not employed. Obituary* 27 Dec 2005� Funeral services for Mr. Edwin C. Culpepper of Jonesboro, LA will be at 10:00 AM, Wednesday, December 28, 2005 in the Chapel of Edmonds Funeral Home in Jonesboro, LA. The family will conduct the service. Burial will follow in the Gayla Traina Memorial Cemetery in Jonesboro under the direction of Edmonds Funeral Home. Visitation will be at Edmonds Funeral Home from 4:00 PM until 8:00 PM on Tuesday, December 27, 2005. Mr. Culpepper, age 93, joyfully departed this life for his heavenly home on December 23, 2005. He was retired from Stone Container Corporation. He was also retired from crop farming but still had a tree farm operation at the time of his death. For many years he served as Secretary-Treasurer of the Jackson Parish Farm Bureau. Until his health failed him, he was an active member of the First Baptist Church of Jonesboro where he participated in numerous activities, including mission trips. Mr. Culpepper is survived by his wife of seventy-two years, Mrs. Myrtle Perry Culpepper of Jonesboro, LA; four sons, Rev. 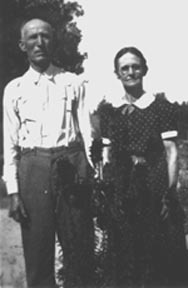 Howard Culpepper and wife Patricia of Huntsville, AL, Dr. Everett Vance Culpepper and wife Bonnie of Myrtle Creek, OR, Bobby Culpepper and wife Beth of Jonesboro, LA, and Mike Culpepper of West Monroe, LA; three daughters, Ms. Lynette Sandidge of Tallulah, LA, Mrs. Nelda Jane Oliver and husband Dr. Paxton Oliver of Calhoun, LA and Mrs. Margaret Brumfield and husband Pat of Jonesboro, LA. Mr. Culpepper is also survived by too many grandchildren and great grandchildren to count. Grandsons Todd Culpepper, J.J.Culpepper, Paxton Oliver, Robert Lynn Tolar, Jeff Culpepper and Paul Oliver will serve as pallbearers. Obituary of Edwin Chester Culpepper, originally published December 27, 2005. Crawford W. Culpepper, son of John Abner Culpepper. Crawford W. Culpepper passed away December 15th 1999 at his home in Jonesboro Louisiana. He worked for Mitchel's Dairy for a number of years. He worked for the Jackson Parish Police Jury where he operated a motorgrader for the parish. He went to work for the State of Louisiana in the Voting Machine Department for Jackson Parish in 1963 until he retired in 1978. He went to work for the Jackson Parish Council on Aging driving a van for the elderly. He was Church Secretary for Hodge United Pentecostal Church from 1969 until March 1999. He was preceded in death by his wife Hazel Culpepper. He is survived by a son and daughter-in-law, Jimmy and Carolyn Culpepper of Hodge; a daughter, Sharon Milks of Hodge; a daughter and son-in-law, Louise and Leroy Roebuck of Quitman; and a daughter and son-in-law, Carmen and Charles Harper of Jonesboro. He also leaves behind 8 grandchildren and 8 great grandchildren. Ressie Culpepper and Arthur Stanley, 13 Apr 1905, Jackson Parish, LA, Book G, p. 298.